Newspaper entrepreneur David Montgomery, has partnered his National World business with data management platform, Carbon by Clicksco (Carbon), in a strategic move expected to increase revenue and readership for publishers, ensure more transparency for digital advertisers and better target audiences with rich, relevant content. Together, National World and Carbon believe they can deliver value for owners and investors by aggregating news publishing sites in one place while retaining the distinct appearance, brands and content of each. Using intelligence from 1.25billion global customer profiles, Carbon promises to reach more consumers with intent to purchase, based on their data. Thanks to its unique taxonomy, which allows for better quality audience management, publishers will be better able to attract a premium from advertisers previously difficult to unlock and leverage. The industry-first partnership is being rolled out amid research showing that despite a UK online audience reach of 84%, news publishers see just 4% of the UK’s digital advertising spend, while reportedly over 60% of global digital advertising budget is in the hands of the two media giants, Facebook and Google. David Montgomery, who was editor of two national newspapers and then ran a succession of media groups in the UK and Europe, said: “The benefit of this single platform run by data scientists is that publishers can see their audience value grow through more sophisticated data management tools and at the same time shed their individual digital infrastructure costs. John Rowe, Group CEO of Clicksco said: “Faced with stagnating online sales and the loss of print revenues the industry is in a vicious circle that threatens the quality, originality and quantity of content. This partnership will give back control to the publishers through a single, cost-efficient platform. 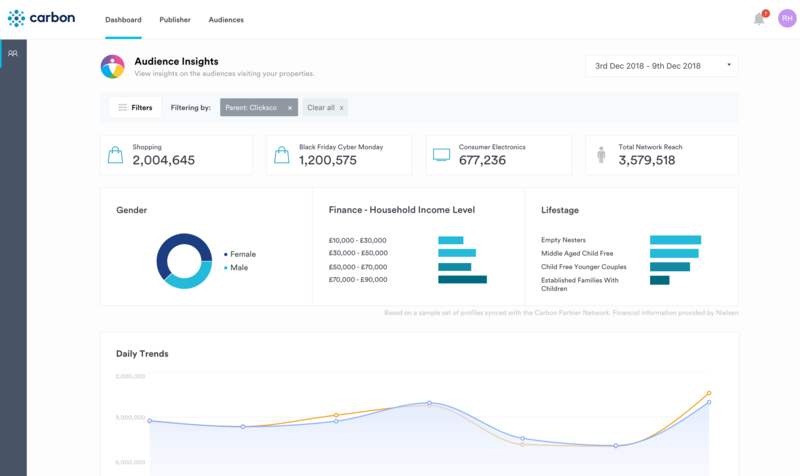 Carbon, a tried and tested AI-driven intent data platform is the result of years of data science expertise and development, and was launched by Clicksco in February 2018. It allows agencies, advertisers and publishers to use their audience data for better personalisation and greater revenue. Several publishers in the US and Europe, including Say Media which is the platform behind Maxim.com and History.com, have already embedded Carbon technology. 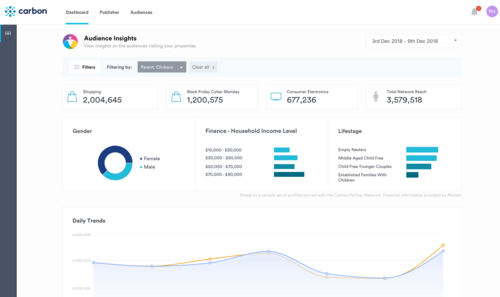 Built natively on Clicksco’s own data lake, the cloud-based DMP uses machine learning to better understand the needs, behaviours and intent of consumers from acquisition, through to engagement and conversion, delivering more personalised online experiences and more profitable audience data monetisation. In the future, Carbon could allow unique ways of searching and interacting with content while cross-selling subject-based subscription packages across multiple publishers. Passionate about taking a proactive approach to data handling, Carbon works to an ethical by design mantra, safely collecting, managing and leveraging data within GDPR guidance and beyond. This press release was distributed by ResponseSource Press Release Wire on behalf of The Tonic Communications in the following categories: Consumer Technology, Business & Finance, Media & Marketing, for more information visit https://pressreleasewire.responsesource.com/about. A boutique, national PR agency with bases in the North East & East Midlands. Strategic, creative & results-focused consultancy.